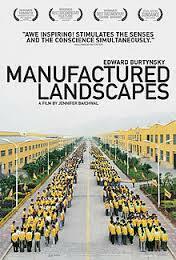 The short film, Manufactured Landscapes, brought light to the face of industrialization. It highlighted a side of industry that many of us in the states are unaware of since we are shielded from its true nature. In America, cities and even most rural areas are separated from factories and congested work areas. The crowded areas of American cities are largely focused in commerce, where as the film indicated, quite the opposite has taken place in China. As the film mentioned, China is a relative late comer to the world of industry and as Edward Burtynsky’s photographs show the urbanization in China is strikingly similar to pictures in our history textbooks about the 19th century textile factories and the sudden urbanization of America. The photographs of Shanghai, best clearly distinguish this point. Burtynsky highlighted the rundown, decaying, crowded stone slums of Shanghai; focusing on how densely built the houses were one on top of the other. However, as the shot slowly zoomed out (a style often used in this film) we learned that all these derelict slums were surrounding the modern hub of downtown Shanghai as monstrous skyscrapers towered over the nearby hovels. This isn’t unique to just China. Instead, it is only unique because it is happening in this day and age. In today’s world it is nearly unthinkable to believe a bolstering city like Shanghai is encircled with impoverished shantytowns. Consequently, this was the case more than a century ago in America and Europe during the Industrial Revolution. As cities rapidly built themselves up via growing industries, the nearby rural areas were deplorable living areas that surrounded these new Meccas of monetary growth. As already mentioned, the film does a wonderful job chronicling the urbanization of China, however with the focus on urbanization I’m unsure if I agree with Burtynsky’s initial quote. His photographs of forgotten coal mines and slate quarries provided a great amount of sympathy towards this notion of destruction. In such, photographs we could see the Earth carved and scalped apart with accurate precision only to be left there wounded with open sores – forgotten once profits were made. Burtynsky mentions how these lost quarries in Pennsylvania sparked his imagination and were the catalyst for this film. However, aside from these photographs I saw (and felt) little else in the documentary that connected with us (humans) destroying ourselves by destroying our world. I say this because as staggering as the imagery was in this film it is merely a modern representation of a chapter majority of the world has already gone through. Once upon a time New York City, London, Paris, Detroit, Boston, Berlin, all these cities (and nations) shared similar fates at the hands of industrialization. Most of these cities/nations have climbed out of the poisonous shell urbanization can cause evolving into what we refer to as modern and progressive cities. Yet, there was a time where all these modern cities looked as gloomy as Shanghai, if not worse. Urbanization is a cycle. One that projects the old cliché, ‘it gets worse before it becomes better.’ Hopefully, over time China can find pull themselves out of the current dark, vicious side of this cycle. Ironically, as deplorable as this pattern may seem the reality of it was clearly shown in this documentary. As China navigates through its own Industrial Revolution, the rest of world thrives off the products China helps provide. I believe Burtynsky wanted to accent that notion, perhaps not as a call to action, but rather shed light on where exactly the products we use come from and where our ‘old, outdated’ products go to die. To further accent this point, the factory scene where clothing irons were being manufactured and then hung like pieces of meat in a freezer waiting for their deployment orders, struck a chord with me. The scene did a wonderful job of showing how methodical and busy factory work is; it also showed how little consumers care about how their products are made. I could only imagine what the iron-making factory lines looked like during the holiday season as consumer demands skyrocket. Do majority of consumers (us as Americans) actually care? Or does this fall under the out of sight, out of mind philosophy? After all, Burtysnky was shooting most of this film with products and equipment that was likely built in very areas of the world he was shining light on. At the end of the day, is there any way to truly stop industry? It may appear as an enemy to nature, but could humanity live without it? Industry is a man-made machine. It was built from the ground up just like the products in this film. It will continue to live on through a never-ending cycle of growth, decay, destruction, and reconstruction. This entry was posted in Uncategorized and tagged Edward Burtynsky photography, Industralization, manufactured landscapes, Nature, photography. Bookmark the permalink.